We at the University of Helsinki IT Center have been busy preparing new services for researchers after Project Mildred. Our primary focus has been on supporting research processes, such as storing, sharing and publishing research data. On this note we have exciting news – a new research support tool Datacloud is being trialed. Datacloud is a new solution for storing and sharing research data. Based on a distributed storage system that provides scalable and efficient object storage with an S3 interface, the initial size of Datacloud storage is a whopping 558 terabytes. The storage infrastructure enables several petabyte infrastructures in the future. 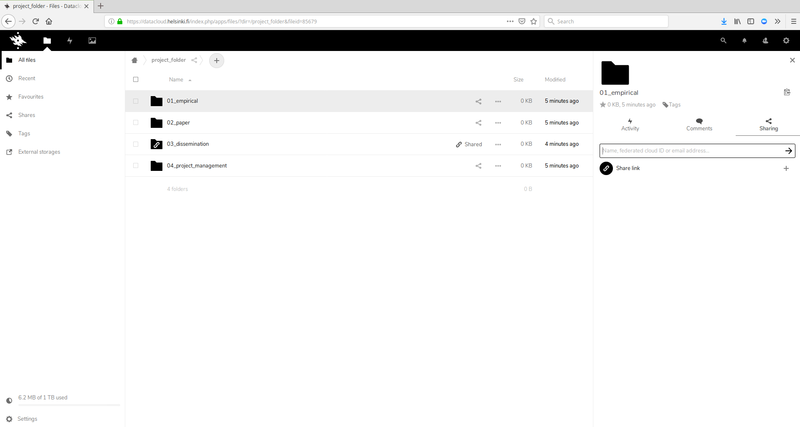 Datacloud’s user interface has been designed using Nextcloud technology. It enables client software to sync files directly from desktops and has a web interface with full functionality. Additionally, Datacloud supports several mobile applications and enables Cyberduck as an optional data interface. Other access possibilities will become available in the future. Datacloud has a simple, easy-to-use interface. Nextcloud gives you the possibility to share data with anyone anywhere. Only a functioning email address is required. Research groups can maintain their own member lists of users who are authorized to access shared spaces in Datacloud. This means that no administrator privileges are needed to authorize users to group spaces. Datacloud is now being trialed, and the development team is looking for research groups that would like to try the service out during this phase. Storage sizes are up to 50 TB per research group. Due to the trial phase, storage space is free of charge until the end of 2019. The final business model and pricing of the service will be decided and published before Midsummer. Data backup is not included during the trial phase, but the system includes data version control functionality and will have a recycle bin going forward. Please note that the service is not suitable for personal or sensitive data at this phase. You can get more information about the Datacloud trial from the development team at: datacloud@helsinki.fi. Next our research data development services team is focusing on a new backup service for research data and the next phase of Datacloud, which includes services for storing and sharing personal or sensitive data. Our team is also looking into new ways to support researchers with more efficient and versatile data sharing and publishing systems via the CSC-operated EUDAT B2DROP and B2SHARE cloud services. 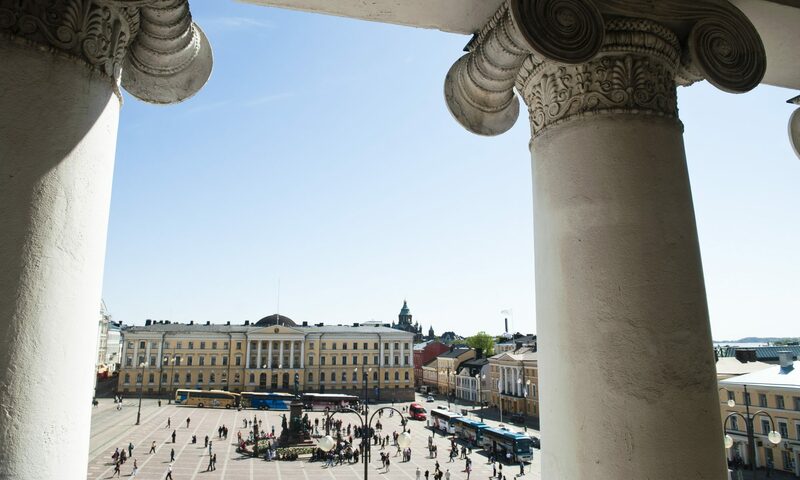 The University of Helsinki IT Center and CSC have a framework agreement, within which B2DROP and B2SHARE as well as several other new services have been purchased. The B2DROP service is based on Nextcloud technology while B2SHARE utilizes Invenio. B2DROP enables the possibility to publish data sets directly from the system. B2SHARE also offers metadata management services and is therefore a great way to make your research data more FAIR (i.e. findable, accessible, interoperable and reusable). B2SHARE also offers persistent identifiers (i.e. PIDs). This means that you can get the digital object identifier (i.e. DOI) for your data set directly from B2SHARE. These exciting services will be ready for users before Midsummer this year. Stay tuned – there’s more to come on research services! A reminder to all our wonderful researchers: if you have any questions about research data, please do not hesitate to contact datasupport@helsinki.fi. Datasupport is a network of specialists at the UH Library, IT Center, Central Archives, Research Affairs, Personnel Services, and Legal Affairs. Ville Tenhunen is the Team Lead for the IT for Science team at the University of Helsinki IT Center.